As promised, the Legislative Matters Committee will be meeting on Monday January 26th at 7:00 p.m. to discuss the new snow policies adopted by the City just this year. The Committee will be meeting as a whole to allow all the members of the Board of Aldermen to attend and comment. Legislative item numbers 198318 and 198319 – both submitted at the January 8th Board of Aldermen meeting – are the only occupants of the night’s agenda. 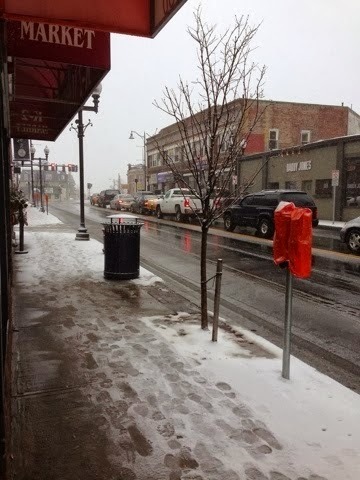 Snow policies were updated by the Curtatone administration in December of 2014 that had residents seeing higher fines and less time to clear City sidewalks after a storm. The policy states, “If snow ceases to fall after sunrise (during daylight hours), property owners musshovel sidewalks by 10 p.m. If snow ceases to fall after sunset (overnight), property owners must shovel sidewalks by 10 a.m.” Fines for failing to comply start off at $50 for a first offense and can result in a lien on property if the City has to use its own resources to clear the snow. Brightly colored decals will be left on the door of those who are being cited…this is also known as being “Scarlett Lettered.”In a press release, the City stated that it would work with those members of the community who are physically unable to shovel by pairing those residents with Somerville youth through a collaboration with the Office of Commissions, the Health Department and the Council on Aging. Residents would be responsible for paying for the snow to be removed. The new policies have been received with mixed reviews according to Aldermen. While some look at it as a serious safety issue (with at least one, saying the timeline is not strict enough), most residents see it as impossible given work and school responsibilities. The Legislative Matters Committee is chaired by Alderman At Large Mary Jo Rossetti with Aldermen at Large Bill White and Jack Connolly, Matthew McLaughlin (Ward 1) and Mark Niedergang (Ward 5). The costs of having snowed removed by either a company or an individual are prohibited by most people. Households owned by a retired or disabled person should be on a sliding scale basis. There is also the problem with people who shovel snow back onto the sidewalk and the city trucks who pile up the snow. Yes, there should be something done about people who don't shovel, I think the city should ask before they stick a "Plague" sticker on your door. There are not enough neighborhoods where people help each other else anymore. All the officials had to do was enforce the "old" rules, which they did not.... do with very rare exception. Snow after snow storms,last year, for days on end after the snow stopped falling; many, many commercial entitities in my area; and also sidewalks on Highland Ave. from Cedar Street to Central Street, including in front of the Somerville Hospital, never were cleared or treated with sand when turned to ice. And why in the hell are they addressing this issue in the middle of winter???? Any changes to the snow policies should of been brought forth and published before winter came upon us. Under the old snow removal rule the somverille authorities, to my knowledge, only ticketed when a complaint was received. We can add the ward 5 "hill" streets such as Lowell Street and Cedar Street, where sidewalks, year to year, never get cleared; and no tickets issued. Made more dangerous by piles left by plows at the corners; and the fact of the hills.